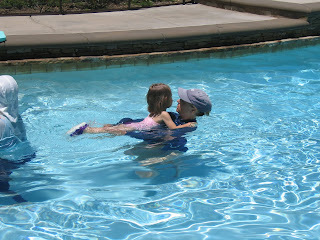 Madeline started her swim lessons this week, and although we've had some rough moments, overall, she's doing great! She has a marvelous teacher, Miss Barb. Madeline doesn't like to go under the water (imagine that, Grammie), but she does a super job going under, turning, and reaching for the side of the pool. 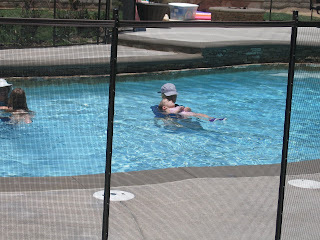 These lessons are teaching her the basics of water safety (ie. what to do if she falls in or can't touch the bottom). She is learning to float on her back and even jump in and keep her eyes open under the water so she can see the nearest step or rail. Pretty soon she'll be giving me lessons! 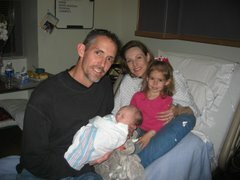 Now there is a gal after my own hesitation (commonly known as "fear")! I will pray that her hesitation of being under the water for even a split second will rapidly pass into past history and she will tell Grammie how much fun it is to be like the fishies! I did not see Mommy putting her head under water....did it happen?